"May God continue the unity of our Country as this Railroad unites the two great Oceans of the world." 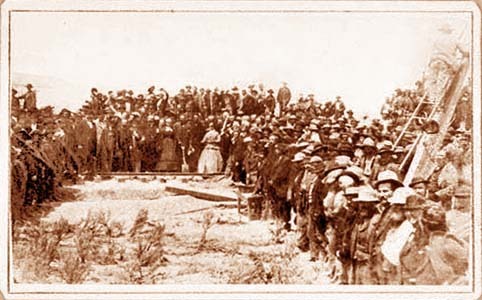 Joining of the rails linking the Central and Union Pacific Railroads, May 10, 1869, Promontory Summit, Utah. CPRR's "Jupiter" engine on the left, UPRR's engine "No. 119" on the right. "One of the classic icons of American imagery." (Detail of Savage and Ottinger carte de visite with manuscript title, "Jubilation Laying the Last Rail." Historic Photo Courtesy C. Wesley Cowan. © 1999-2019 CPRR.org – *Permission required for any use other than personal educational web viewing; no warranty – Click on any link or image to indicate "I ACCEPT" the USER Agreement. "The visionary Theodore Judah laid the engineering groundwork, but Samuel Montague and Lewis Clement carried it over (and through) the great granite peaks, across the Donner Pass and down the Truckee Canyon." Robert M. Utley, The New York Times Review of Books, December 12, 1999. Overcoming incredible obstacles, transcontinental railroad construction finished 7 years ahead of schedule! 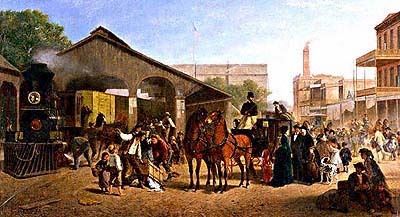 "Sacramento Railroad Station" 1874 painting by William Hahn. Courtesy UC Berkeley, Digital Library Project. 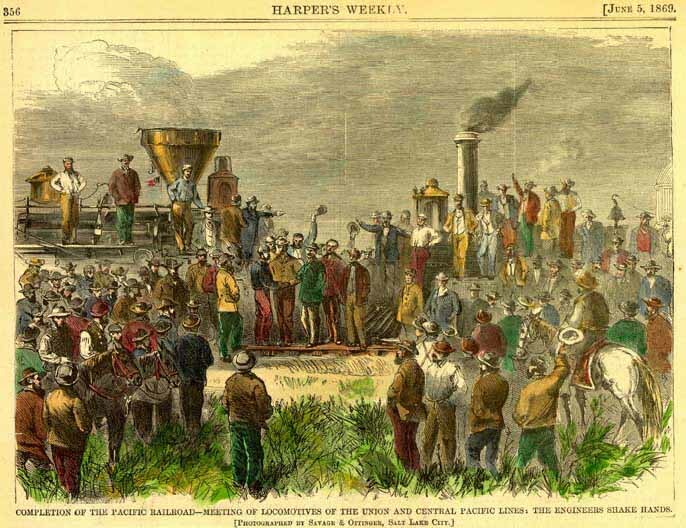 The idea for a transcontinental railroad "to shrink the continent and change the whole world" was first proposed by men of imagination in 1830. It wasn't until 1862 that Congress passed a bill authorizing such a venture. 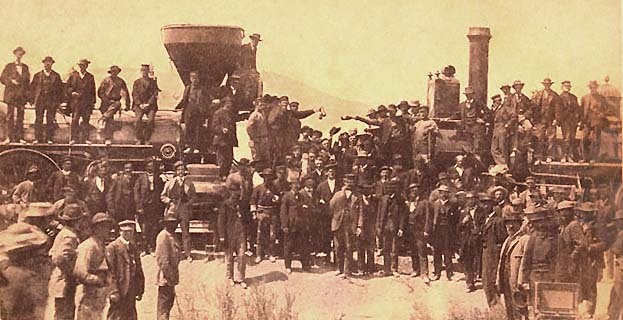 In 1869, after a long, bitter and often terrifying struggle against Indian attacks, brutal weather, floods, labor shortages, political chicanery, lawlessness and a war, the first transcontinental railroad finally became a reality. Now the way was open for vast expansion and social changes that would make America the industrial giant of the world. ... One of the great engineering feats of history and ... a fascinating chapter in the development of our country. [After Rails Across the Continent: The Story of the First Transcontinental Railroad by Enid Johnson.] Text Courtesy Walt Winter. An 1846 Cincinnati newspaper mocked the utopian claims that a railroad could "create settlements, commerce and wealth"; the project's supporters, the paper suggested, might as well be promising "to unite neighboring planets in our solar system and make them better acquainted with each other." Photography was a critical marketing tool for financing with transcontinental railroad bonds – both the CPRR and UPRR hired photographers to document the progress of construction, producing the numerous stereoviews which now illustate this website. The camera equipment of the day was so large and heavy that a photo wagon was needed. Wet glass plate collodion negatives had to be produced in the field, required long exposures, and albumen paper required 20 minutes in sunlight to make photo prints. Today's digital cameras by comparison are a marvel — to select the best camera to create photographs for the CPRR Museum website, we found invaluable the extensive reviews on a great site for digital cameras, Digital Camera HQ. © 2019 CPRR.org – By visiting this site you agree to the terms of the CPRR.org User Agreement. Permission to browse this website is contingent on acceptance of the User Agreement. Freight Train Rounding Cape Horn, 2487' elevation. (Watkins' New Cabinet Series, detail). [Topo Map; Aerial Photo] See other Watkins views at the Getty Museum & Royal Geographic Society. 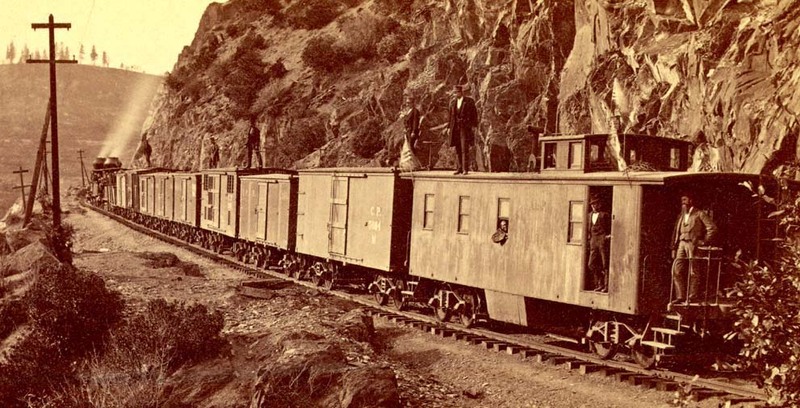 In 1864 the first Chinese workers were hired, and starting in March, 1865, thousands of Chinese in Kwantung Province were recruited by Central Pacific Railroad Co. to work on the western portion of transcontinental railroad. The roadbed was blasted out of the solid rock mountainside in the fall of 1865 by lowering Chinese workers (also known as "Celestials" after the "Celestial Kingdom" as these tireless workers referred to their homeland) on ropes down the cliff face. These Chinese men drilled and packed black power charges in the rock, lit the fuses, and had the agility to scamper up the ropes before the explosions. Cape Horn, Sierra Nevada Mountains, California. “The Chinese made the roadbed and laid the track around Cape Horn. Though this took until the spring of 1866, it was not as time-consuming or difficult as had been feared. Still it remains one of the best known of all the labors on the Central Pacific, mainly because, unlike the work in the tunnel, it makes for a spectacular diorama. As well it should. Hanging from those [ropes], drilling holes in the cliff, placing the fuses, and getting hauled up was a spectacular piece of work. The white laborers couldn't do it. The Chinese could, if not as a matter of course, then quickly and — at least they made it look this way — easily. Young Lewis Clement did the surveying and then took charge of overseeing the railroad engineering at Cape Horn. This Is My Railroad, SPRR Video, c. 1940's. Click images to view the two parts of the movie. Courtesy Internet Movie Archive. Praised as "the best RR website on the planet." 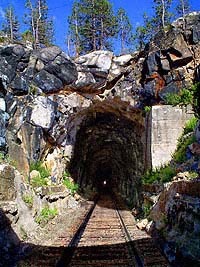 Audio Stream is broadcasting courtesy of Steven Reynolds of Sacramento, California and RailroadRadio.net. Macintosh creator Jef Raskin's book shows how the Web, computers, and information appliances can be made much easier to learn and use! A COMPUTER SCIENCE MUST READ. 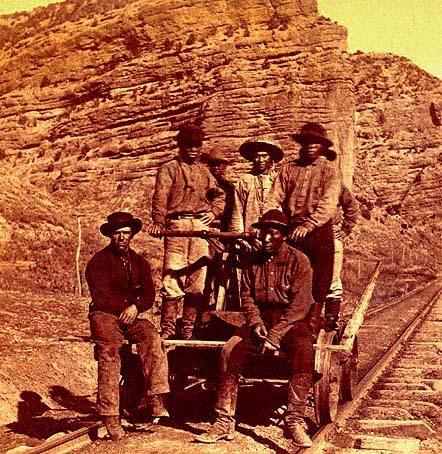 Track workers on a hand car in the Utah desert. (E. & H.T. Anthony Stereoview #7148.) See enlargement and "3D" Stereo. The hand hewn ties are another giveaway that it's on the Union Pacific Railroad. Location identified courtesy Don D. Snoddy, UPRR. "...So work on as though Heaven was before you and Hell behind you." More than 4,500 digitally restored railroad pictures to see – thousands of pages of transcontinental railroad history! Thanks for visiting — more than 2 Million Visitors, trillions of bytes of Railroad Photo History Served! Copyright © 1999-2019 by CPRR.org. All rights reserved. which permits personal use web viewing only; no copying; arbitration; no warranty.